The Cincinnati Buckeyes are eagerly awaiting the start of the 2018 season of 1860’s base ball, which begins with a full day of base ball on Sunday, April 15, at “The Rail Yard” in Dayton, OH, home of the Eastwood Iron Horses. 2018 will see some great matches for the “Boys in Blue”, as they take on many of the other local vintage nines from southwest to central Ohio and southern Indiana. Their long trip of the summer will take them back for a rematch with the famed Lah-de-dahs at Greenfield Village in Dearborn, MI, as well as (hopefully) a visit with Stemtown Stinkers in northern Ohio on the way home. Please take a look at our schedule and plan to come out and catch a game this Spring/Summer! 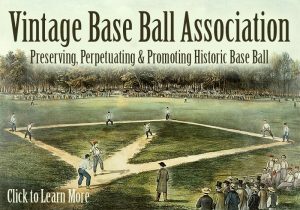 In the meantime, a couple of guys have been busy launching a brand new website for both the Buckeyes and their fellow club mates, the 1869 Cincinnati Red Stockings, as well as a new page for their parent organization, the Cincinnati Vintage Base Ball Club. The new sites now feature responsive templates for better experiences on smartphones and pads, and updating the sites will be an easier prospect for the main guy in charge of them. The Buckeyes are on the lookout for new players for this coming season. If you are interested in joining the team, please contact us and ask how you can join. You do NOT have to be a great ball player to play! You simply need to have a love for the history of the game, the basic ability and experience to play it, and enough free time on your Spring-Summer weekends. A non-competitive demeanor and a thick-skin are necessary as well with us. Unlike base ball of the time, we accept players from all ages, sizes, genders and ethnicities… even the Irish… because it’s not about WHO is playing this game, but HOW it is played. We are having a Club practice on Sunday, March 25, at 1:00pm at Heritage Village in Sharon Woods Park. If you are interested in trying out some hitting and fielding to get a feel for the game and meeting the players, please come out and join us. Last but not least, please be sure to cheer on your Cincinnati Buckeyes as they march with their fellow vintage ballists from around the area in the 2018 Findley Market Opening Day Parade on Monday, April 2. Sure, it’s not actual Opening Day this year, but the party and fun should still be just as great as always, and the vintage teams of this area will be well-represented and part of the parade festivities! Go Reds!